This year marks the 25th anniversary of Mid-America Motorworks' Corvette Funfest, and we're celebrating with a throwback contest! Four winners will each receiving one classic Funfest Yearbook of their choosing. 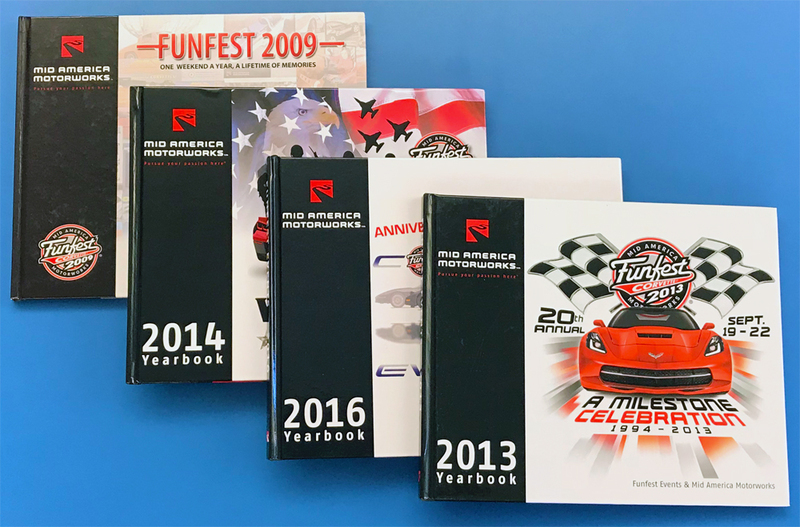 To enter, simply leave a reply below telling us your favorite Funfest memory from any year, as well as which of the four books pictured below you'd like to receive (2009, 2013, 2014, or 2016). But act fact, this giveaway ends on May 21. This contest is now closed - Thanks for participating! I remember when Mid-America had it's grand opening. When I pulled into the parking lot with my Daytona Blue 64 Coupe a rep asked me if I wanted to be one of the lead cars in the world's longest corvette parade and to pick up the stars from the movie "Corvette Summer" at the airport. "Of course I do" I replied. I was number 13 right behind the limos. What a fun weekend that was! Quick Reply: Share Your Corvette Funfest Memories, Win Classic Funfest Yearbooks!